It was an amazing night of celebration in London last night. The opening ceremony, under the direction of Danny Boyle, was full of spectacular visuals, integrated social media, tech, doused with delightful surprises and humor. It was a great mix of pop and classical music. I loved hearing two children’s choirs (were there more?) and the London Philharmonic under the direction of Simon Rattle. It was wonderful to see conductor and musician extraordinaire, Daniel Barenboim, carrying the Olympic flag with seven others. I also loved that happy, energetic drummers stood on the sidelines as the athletes marched in. The drummers kept the atmosphere upbeat and moved the marchers at a fast pace. Music, once again, played a vital role in the opening ceremonies. Congrats to Danny Boyle and the people of the UK. You have a great wealth of creativity. Thank you for sharing with the world. So if you were looking for a list of music heard during the entire ceremony, here it is (thank you, Spotify)! My absolute favorite is Elgar’s Nimrod. What’s yours? While saying good-bye to a happy 5th grade music class, I engaged in a quick conversation with their teacher about what the kids have been learning in my class (song writing: verse, chorus, lyrics, melody, and accompaniment). What would be the best way for the students learn and memorize the words to the Preamble? Would watching a segment in School House Rock be helpful? What musical and thinking skills will the students demonstrate? I concluded that helping the students write their own original Preamble song was the answer. Rather than just memorizing the words to the Preamble, my students sang the words to a tune they composed. Will they remember the words that precedes the US Constitution? Of course. Were they engaged in their learning? Absolutely! Being fearful snuffs out learning opportunities for you and your students. As you prepare your lessons, think of a couple ways you can think artistically. Remember that we are in the classroom to guide the young people in good learning. This means you do not have be the performer. Just create the creative spaces for them. Start brainstorming arts-infused projects and make lists of possibilities. Collaborate with an arts teacher at your school. Share what you are currently teaching and ask simple questions to see if there are possibilities to collaborate on a particular unit. Keep communications clear (time lines and goals) and start with simple ideas. Keep a photo/video journal of the project. Remember 2 Things: 1) not all of your conversations will end up as a project and 2) understand that through the conversations your preconceived ideas may change. Keep an open mind! Look & Listen for Inspiration. Many teachers in my Professional Learning Network (PLN) share a great wealth of resources and lesson ideas. I read blogs posted by these teachers and see how I can apply their project ideas into my classes. You can do this, too. Look for inspiration in other creative teachers. Also look for inspiration in your students. Many young students are tech saavy and know really good sites for music. Ask them to share their good finds with you. They will be happy to share when they know you are opened to be taught by them. Here is an example of how I listened to my students. Did you ever try using applications like GarageBand or Audacity to create your own remixes or mashups? Or have you ever tried playing music related games like Tap Tap? What is keeping you from learning? What would you like to try first? ~ Making an iTunes playlist titled, __________ (fill in the blank, i.e. quiet work time). What music would you include and why? ~ How about a podcast featuring a student and using music in the background? Whatever the project, give yourself some time to use a specific tool and get comfortable. Here are some links you can start exploring. Relax. Take one step at a time and enjoy the process. Your joy of learning will be infectious– even when things just don’t work out. Remember I asked you to journal about your learning process? Now share your journey with other teachers! Leave a comment Talk it Up! Hi! I’m an ISTE Newbie. I was attending the ISTE (International Society for Technology in Education) conference for the first time past week. I had no idea how big this conference was before my arrival. To tell you the truth, with the exception of my presentation, I was not at all prepared for its enormous everything. With 12K+ attendees and exhibitors the Pennsylvania Convention Center was one busy hotspot (this is an unofficial number. I’ve also read other attendees mention 18K…)! With many conferences under my belt, I thought this conference would be just like the others. The truth is that I felt quite out of place as I wondered around the crowds and (what felt like) endless conference space. But all was not lost! I am connected to a lot of educators online and have been “conversing” with many of them over the last year and a half. But meeting these people in person is one of the greatest moments I will experience. I have had the pleasure of seeing and hugging many of my friends for the first time. It was incredible to match their faces with their voices. What was more fascinating was that many of our edu conversations continued on. I enjoyed every conversation whether it took place in the conference lounges/cafes, over dinner, or right after some sessions. Passionate learning and thinking together in person beats any virtual space. I am also thankful to have met new teachers with whom I can learn from. Presenting at ISTE was something quite special. I was honored to present with Elizabeth Peterson, Michelle Baldwin, and Kyle Pace for the Music and Tech: Harmony in the Making session. Although I was a presenter, I learned much more. I really appreciated how my co-presenters shared about how they help their students to make deeper connection to learning through music and tech. I am so glad for those teachers who were hesitant at first, but decided to to come to our session. My friend Doug Peterson (@dougpete) came to our session and wrote this blog post. I was quite nervous to have friends like Doug in the crowd, but also was empowered by their support. So thank you, Doug, friends, and all those who attended our session! 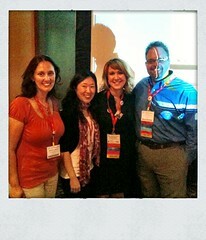 It was especially great to meet @musictechie, @dougbutchy, @rdammers, and @DoeMiSo from my MPLN (Music PLN). I was reminded again that many teachers are looking to the “arts experts” for creative ways to teach. I hope I can continue to do my part in sharing ideas and advocating for the arts education. I was thankful to see many arts offerings at ISTE and feel tremendous honor to have had the experience. I hope to encourage and partner with many arts teachers to consider presenting in the future. Kudos to all educators! There are several things I want to remember if I ever get another chance to attend ISTE. Read the program & add handful interesting sessions at least to the ISTE app. I did not look carefully or plan well. I, unfortunately, did not get over the enormity of the conference. It was hard for me to know what to pick on the spot. Next time, I will at least have a list of sessions I want to check out. Know the layout of the venue. I was clueless where things were. I would not have wasted a lot of time if I knew at least where some things were. I was thankful for the many volunteers who were everywhere who helped me. Next time, I will look at the map! Enter the exhibition with a goal. I had some kind of allergic reaction (not really, but figuratively) when I entered the exhibition hall that made me come right out. It was just so big and I didn’t know where things were. Next time, I will seek out specific companies to check out innovative ideas. Set aside time for poster sessions and special workshops. Again, there were so many that I’ve missed because I was so tired! Talk to more people. I may not get another chance to talk to a presenter or someone from the PLN ever again. I need to make time for more f2f and make effort to talk to more people. They just might be as lost as me! So what am I going to do now that I have attended, ISTE? I am going to remember what great experience it has been to connect and learn. You, who are in my PLN, will be there to excogitate (to think out; to find out or discover by thinking; to devise) with me. It comes back to building relationships and conversations, doesn’t it? 8 Comments Hi! I’m an ISTE Newbie. I just watched Kevin Spacey on Hardball (msnbc.com). It doesn’t matter what political side you are on. The arts and culture are should be rights of all Americans to have and to protect. As Spacey says in this segment, it’s not about who hates the arts (the act of cutting budget on programs such as PBS or Metropolitan Museum of Art), but it’s about making the Arts and the Arts Education a must-priority of our country. We need to fight and protect the ARTS. This is for our children and their future.